Heartgard has just bought out this app which allows you to schedule when your next dose is available and when it is time to restock it. All you need to do is put in when you give your dog the Heartgard and it will set a reminder for each time it is due in the future. This will be a very handy app for a lot of people, including me. This app is available for iPhones, iPod touch and iPads. It requires iOS 3.0 or later to run. 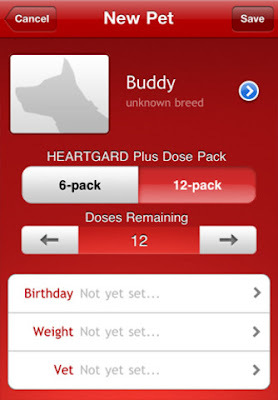 This app can be found at the itunes store here at Heartgard (ivermectin) Dose Reminder App.